Frost free refrigerators have gained popularity over the years for their ease of handling and low maintenance. Considering the high demand for these refrigerators, Whirlpool has also stepped ahead with its extensive range of frost-free refrigerators. Right from the side by side door, double door, to single door, Whirlpool has taken care of distinct requirements of people by providing a wide range of Frost Free Refrigerators. Precise for small and medium size families, these frost-free refrigerators by Whirlpool are available in the capacities of 200 litres to 635 litres. Not just that, but these Whirlpool Frost-free Refrigerators also carry 2 to 4-star ratings, which shouldn't make you think twice before purchasing them. The list of features is also huge. Integrated with advanced technologies, like 6th Sense Intellifresh Technology, and moisture retention technology, most of these refrigerators contain UI, 3 Intellisensors, deodorizer, adjustable rack, removable gasket, fresh flow air tower, air booster system, ice collector, fresh keeper, and more. 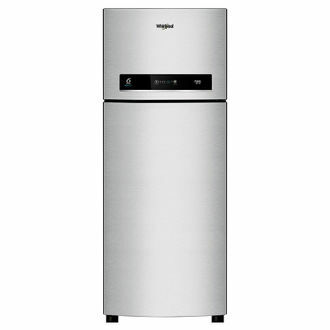 Find out the price list updated on 24th April 2019 of 68 Whirlpool Frost-free Refrigerators. With more and more e-commerce portals available on the internet, it has become a plain-sailing to buy online almost anything today. So, when it comes to the refrigerator, you aren't short of choices anyhow. Be it Amazon, Flipkart, TataCliQ, or any other website portal; you can always find Whirlpool Frost-free refrigerator models listed on almost every prominent site. Compare the features, specs, and reviews while keeping your requirements in mind. After that, you can compare the price and can hit the purchase link. To have an idea about the cost, check this page and the models listed above.